Posted by rawkfistmusic in 2007, Strata. Many times experimentation in rock music is met with failure. Many fans of the band feel isolated by a major change, and oftentimes the music is criticized for being a major departure from the well known sound. Yet, time and time again rock musicians insist on this silly thing called “evolution” in an attempt to make themselves feel better about doing nothing but strumming on instruments all day long (I kid people, I’m sure there’s some other reasons too). 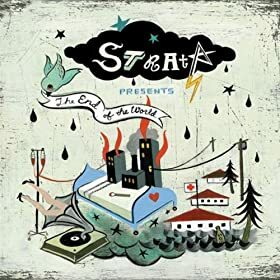 And so, despite the failures of many before them, hard rockers Strata took a huge gamble in 2007 with the release of Strata Presents The End of the World, a major transition from their post-grunge inspired debut to be sure. If you don’t figure out pretty damn quick that Strata made a big time jump as “Night Falls (The Weight of It)” kicks in, you may need to get your hearing checked. The opening track is nothing like the dark rockers such as “The Panic” or “Never There” from the self-titled debut, but instead commands your attention with a killer drumbeat and vocalist Eric Victorino’s piercing high voice crooning some brilliant words. “The walls of this city are all cold metal and stone, but we’re nothing permanent we’re just soft skin and bones,” is just one display of Strata’s obvious lyrical evolution. The difference in musical style is noticeable as well, as there’s far less overpowering distortion in the guitars, and much more focus on the band’s strength, Victorino. Every track on Strata Presents The End of the World is mind-numbingly unique, from the soft and comforting “Hot/Cold (Darling Don’t…)” to the relentlessly quick “Cocaine (We’re All Going To Hell)” (Too many parentheses yet? Don’t worry, I think I’m done with those). The album’s flow would seem erratic based on such varied musical styles, but never once does the disc feel awkward, but instead it feels as though every song was perfectly chosen for it’s piece in the grand puzzle of this end of the world. Those two songs with such drastic differences in style are just separated by one song as early album-goers, as crazy as that seems from listening to them. Each and every track also delivers one of the things that makes a lot of bands today so great; raw passion. “Coma Therapy” stands out as music that plays along with Victorino’s every sultry-sung word. The drum pounds with your heart on the verses as the lyrics build up to the soaring chorus, a beautiful ballad that Victorino clearly poured his soul into, and it shows. Don’t get caught in it’s entrancing three and a half minute span though, or “Poughkeepsie, NY” will kick your teeth out. The track stands out lyrically as do the others, a story of a man meeting with “the devil” in a bar, but it’s dark tone combined with the repeated “Hallelujah” lyrics from Victorino stand out as a great intentional irony. It’s hard to fault any album as good as this one for it’s experimentation that has clearly paid off so gloriously, but fans of Strata’s previous work are obviously all on the fence regarding this disc. It’s a great descent from Strata’s last album, and leaves little reminiscence of that time. The disc has a much softer vibe, and there’s far less focus on instrumentation. The other glaring flaw is the politically charged “The New National Anthem.” Some will view the lyrics of the song as the best on the album, while others will no doubt attack it for daring to speak what it does. It’s the only political song on the album, but not all songs of this nature will be taken kindly. The other faults? Well, there just aren’t any. I’d love to call this album perfect; it does everything right after all. Victorino is one of the best vocalists out there, something I’d never expected to say after the first album, and his lyrics are as top notch as his vocal quality. Strata is no longer in the business, Victorino is pursuing other projects, and this may has well have been his first. It’s all his writings, his music, his passion poured into every crack. Enough dancing around, is Strata Presents The End of the World a perfect album? Not quite, simply because it takes a lot of effort to love this album. It’s different, it’s not real attention-grabbing, and it’s not entirely identifiable. It’s an isolated record, and the listener may have a hard time “feeling” it, but when you finally get it, there are few albums better. The Point – Eric Victorino shines as the vocalist for Strata, a band that despite major change, has succeeded in creating an original and beautiful album. It may take some to appreciate it, but it’s worth the effort to get a chance to hear these marvelous songs. good to know taking that risk worked out for them. I’ve heard the New National Anthem, loved it. I’ll have to check out the rest of the album!